On Sunday, the final day of this year’s Festival at Sandpoint, fireworks will blast the evening, and the festival, goodbye. Before that, the Spokane Symphony will provide the soundtrack to the lake and mountain views. But before all that, there will be wine. Lots and lots of award-winning wine, almost half of it made in Idaho — not a state many associate with winemaking. But the wine industry in Idaho is, indeed, on the rise, and the Festival at Sandpoint hopes to highlight that. A study by the Idaho Department of Agriculture shows that 656 acres of Idaho land was made up of vineyards in 1999. Today, that number is approximately 1,600. The impressive numbers don’t stop there. In 2002, there were only 11 wineries in Idaho; by 2010, there were 43 wineries in Idaho. Just two years later there are 49. With the purchase of an admission ticket to the festival, of-age oenologists and neophytes alike can sip wine between 4:30 and 7 pm with unlimited complimentary tastings (the concert starts at 7:30 pm). 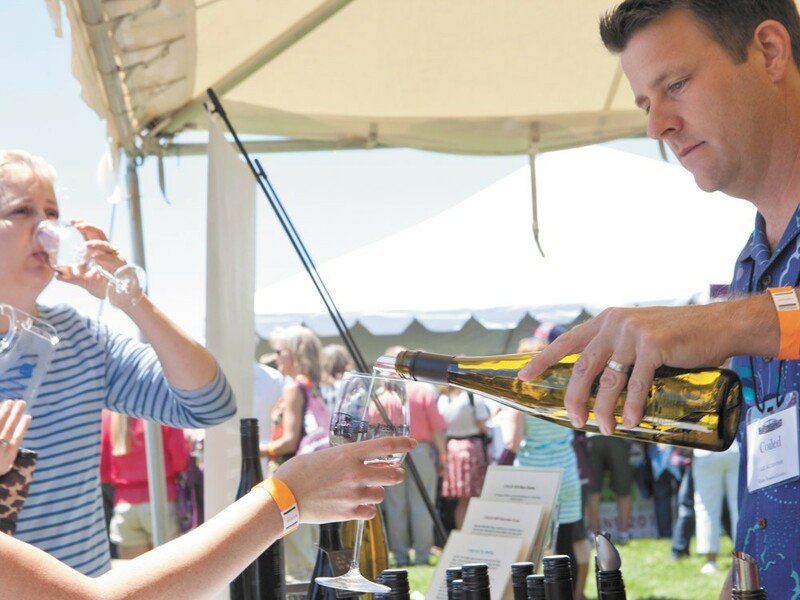 Of the 39 wineries represented at the festival, 18 are from Idaho, and some of the wine being poured has recently won significant awards. John Danielson, the winemaker and one of the owners of Vale Wine Company out of Caldwell, will be pouring some of his winning vintages, including a 2009 Red Blend – known as “Rendezvous Red” – and their 2011 Viognier, both of which won silver medals at the 2012 NorthWest Wine Summit. That competition included more than 1,400 entries made in Alaska, Alberta, Idaho, Montana, Oregon, Washington and British Columbia. As for the competitions, Danielson sees his company’s recent successes as further validation. “We’re stacking up with great names from other areas. It’s kind of a way to benchmark yourself. For us, we’re in southwest Idaho, so we’re pleased to be invited to pour [in Sandpoint],” says Danielson. Other wines receiving recent awards will be pouring their winning wines: Colter’s Creek Winery from Juliaetta will be serving up glasses of their 2009 Kooskoos Kia Red, which won a silver medal from Sunset Magazine, and their 2010 Riesling, which brought home bronze from the NorthWest Wine Summit. Telaya Wine Company out of Eagle, Idaho, will be offering tastings of their 2009 Turas, which also won a silver medal from Sunset. The festival is now in its 30th year and this will be the 14th at which wine has been featured. Over the years, however, the presence of wine at the festival has gradually changed. “At first, several people in town with wine cellars just picked their favorite wines,” says Ron Carlson, co-director of wine tasting for the festival, which is expected to draw as many as 2,000 people this year. “We’ve gotten to know a lot of the winery people. What we’re trying to do is help wineries along. This is a showcase for them,” says Carlson. It’s especially, he says, a chance to taste the fruits of Idaho’s vineyards. Winemaking in Idaho actually has deep roots. It began in the 1860s in Lewiston, and during the decades that followed, vintages from the area were winning awards around the country. Prohibition essentially killed off the industry, though, and the rebuilding didn’t begin in earnest until the 1970s, says Sara Dirks of the Idaho Wine Commission. Idaho does, however, have ideal conditions for wine making. “We have dry summers with hot weather and cool nights, so the grapes get to rest,” says Dirks. She adds that the dry conditions help vintners control the amount of water the vines receive. The state’s sandy, grainy soil helps, as do the minerals in the soil and the lack of toxins, paving the way for a burgeoning industry. Dirks points to a 2008 study conducted by Boise State University showing that the wine industry in Idaho creates 625 full-time jobs, and has a total economic impact of $73 million, which includes wine and grapes sales, in addition to tax revenue. Additionally, Idaho now ranks 22nd in the United States in terms of wine produced. While conditions might be exquisite in large swaths of Idaho, Dirks is quick to caution would-be winemakers. “It’s an exciting endeavor, but you won’t see a return on the investment for three to five years,” she says. But if you hear these enthusiasts talk about wine as if it truly were miraculous, you’ll know numbers don’t matter much. What matters? A summer celebration on a lakeshore with friends and family, and, let’s be honest, a bottomless glass of the aromas and flavors unique to this region.